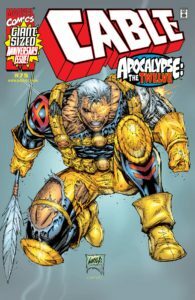 The Cable comic books definitive issue-by-issue collecting guide and trade reading order for omnibus, hardcover, and trade paperback collections. Find every issue and appearance! Part of Crushing Krisis’s Crushing Comics. Last updated November 2018 with titles scheduled for release through July 2019. Looking for Deadpool? You’re not crazy – he and Cable used to share a page! See The Definitive Deadpool Collecting Guide and Reading Order. No single character defines so much of what is right and what is wrong about the venerable X-Men franchise as Nathan Christopher Dayspring Summers AKA Cable. 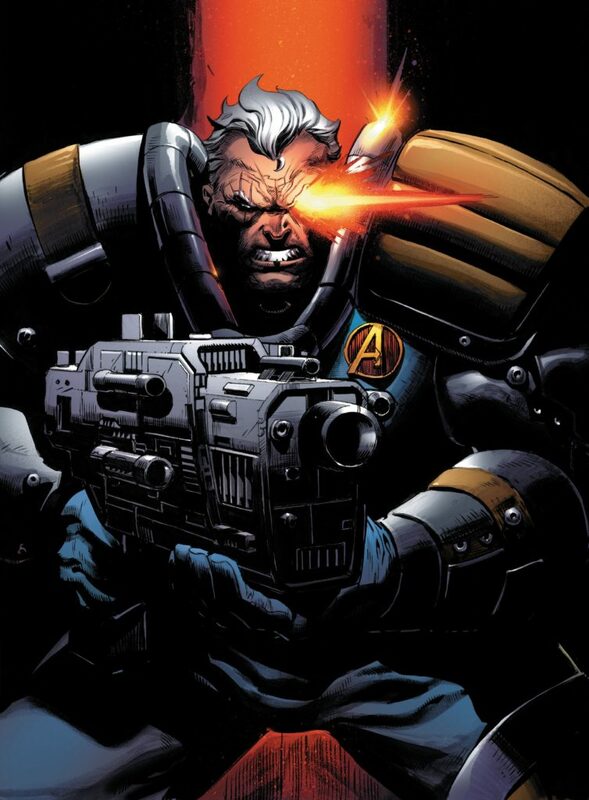 Cable was the creation of Rob Liefeld in 1990 when he took over pencilling New Mutants and was charged with creating a leader for the team that contrasted with Professor X’s more non-violent philosophy. The character he came up with couldn’t be more of a 90s extreme – a Terminator-esque mysterious time-traveler with a glowing eye, a metal arm, a lot of guns, and a set of shoulder pads that tripled the apparent width of his frame. Cable (and Liefeld) lead the New Mutant team out of passivity and lower sales to be one of Marvel’s biggest phenomenons, shedding all but three cast members in the process and relaunching as mega-seller X-Force. However, something even more interesting was going on with Cable thanks to the plot in another X-book – X-Factor. In the wake of X-Tinction Agenda, X-Factor saw Cyclops’s son with Mr. Sinister’s Jean Grey clone Madelyne Pryor being kidnapped to the moon and infected with a techno-organic virus by former Sinister mentor Apocalypse before being whisked off to the future by Sister Askani. 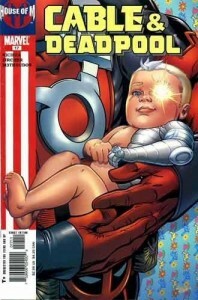 Was it intention or coincidence that a telekinetic baby who was the heir apparent to the X-Men franchise was infected with a metallic virus and sent to the future just months after a time-traveler with a missing eye and a metallic arm with hints of telekinesis landed in the present? It didn’t matter, because fan’s obsessions with the idea that Cable could be Cyclops’s son quickly took over and made the character more in-demand than he was before! That sort of long-term, interconnected, soap opera plotting is what a major part of what makes X-Men comics great. However, Cable’s subsequent adventures offer the insufferable underbelly of X-Men – constantly revised powers, convoluted time travel, unendingly retconned secret agendas, and multiple apparent deaths. Even as a Cable fan it’s hard to say what his current mission is or how many more intermittent jumps to the future he’s conducted since his last appearance. 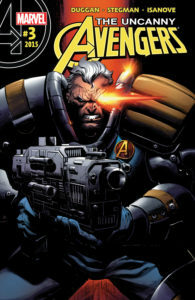 Despite that, Cable has been central to some major blockbusters in the past few decades – including an co-headling with Deadpool, driving both Messiah Complex and Second Coming, and in 2015 anchoring the Avengers “Unity Squad” along with big-league characters like Captain America, Rogue, Human Torch, and Quicksilver – oh, plus his old buddy, Deadpool. That Deadpool relationship is no small part of Cable’s lasting appeal – while he’s a militant curmudgeon on his own, as the Merc With a Mouth’s eternal straight man it’s a little easier to see the heart of gold that makes him so central to the X-Men over 25 years after his debut. This guide is sponsored via Patreon by No Gods or Kings, an episodic novel by Thomas Judge. Join the Crushing On Crushing Krisis mailing list for a notice whenever this page is updated with new collections – plus, a weekly ping about new comics content. Cable was introduced in the closing pages of New Mutants #86, with the following thirteen issues laying the groundwork for two decades of character development. 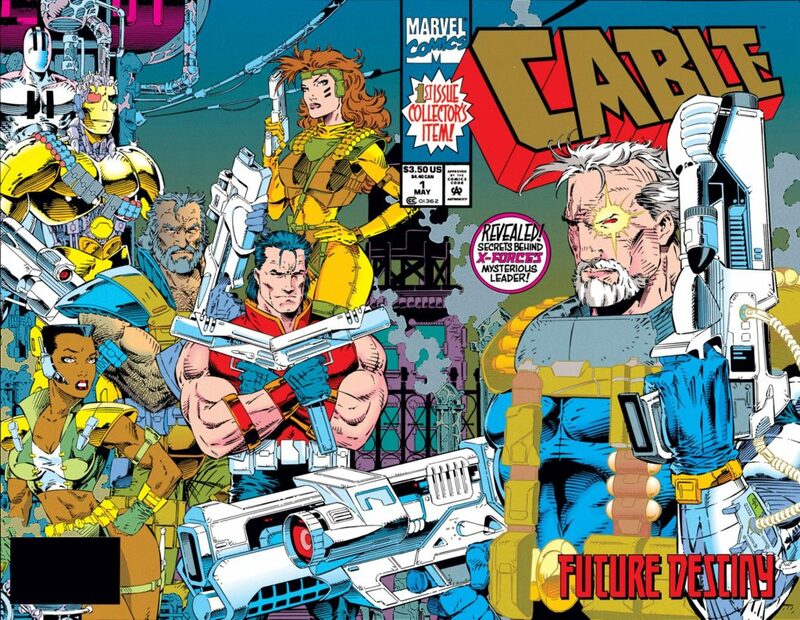 However, as a time-traveler, Cable’s debut issue isn’t necessarily his first story in Marvel continuity. To read the story of Cable in order, follow this sequence. This book could easily be called “Early Cable,” as it collects all of the following in a single, handy paperback – Books of Askani, X-Men: Phoenix #1-3, Adventures of Cyclops and Phoenix #1-4, Marvel Valentine Special (1997), Askani’son #1-4. That gives you a relatively complete sequence of pre-adult Cable, which had previously been collected as detailed below. A one-shot comic defining the cast of Askani, the future clan who took Nathan Christopher Summers from the present. Also in Adventures of, above. An mini-series explaining the future-flung Rachel Summers’ participation in the clan Askani; it doesn’t explicitly feature Cable but is a part of his story. Only ever collected in Adventures of, above. Jean Grey and Cyclops are whisked from their honeymoon to inhabit the bodies of Cable’s adoptive parents in the far-flung future. Also in Adventures of, above, and reprinted in 2018 in both X-Men: The Wedding of Cyclops & Phoenix (full contents below) and X-Men: Cyclops & Phoenix – Past & Future along with Further Adventures of Cyclops and Phoenix and material from Marvel Valentine Special. The continuing story Cable’s adolescence in the future after Cyclops and Phoenix depart. Also in Adventures of, above. Various brief scenes in Deadpool & Cable: Split Second #1-3 occur in this period. This one-shot story takes place prior to Cable’s first appearance in New Mutants. It was recollected in Wolverine Epic Collection Volume 12: Shadow of Apocalypse. Cable (1993) #-1: Not collected. This occurs during the events of Guts and Glory. Cable’s first solo comic was a two-issue limited series introducing elements of Cable’s mystery-shrouded past written by X-Force scribe Fabian Nicieza and penciled by legend John Romita, Jr. 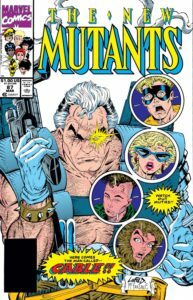 This established that prior to meeting the New Mutants, Cable had established his own present-day team – Wild Pack – which included Domino. The past episodes of these issues occur prior to Cable’s debut. This collection collects Cable’s first appearance in New Mutants #87, Cable: Blood and Metal #1-2, and Cable #1-4. Also collected in X-Force Omnibus, Vol. 1. 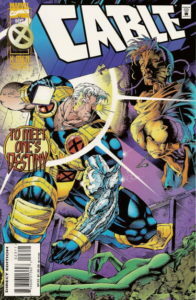 Cable was a regular presence in New Mutants from his introduction in the final pages of #86 through their transformation to X-Force with #100, and then continuing through the end of the X-Cutioner’s Song crossover before graduating to his own title. New Mutants #86-92: In Cable & The New Mutants, above. See New Mutants for more information. After New Mutants #92: Several guides (including Marvel’s own Official Index) listAmazing Spider-Man (1963) #336 as a Cable appearance, but he does not show his face in the Spider-Man story! This is a 1990 annuals crossover between Fantastic Four Annual 23, New Mutants (1983) Annual 6, New Warriors Annual 1, X-Factor (1986) Annual 5, and X-Men (1963) Annual 14. Cable does not appear in the Fantastic Four annual. The collection includes Uncanny X-Men (1981) #141-142 & Annual 14; New Mutants Annual 6; X-Factor Annual 5; Excalibur (1988) 52 & 66-67; Wolverine: Days Of Future Past 1-3; and material From Fantastic Four Annual 23 and Hulk: Broken Worlds 2. A 1992 TPB (ISBN 978-0871357397) collected just the annuals. Collected in Wolverine by Hama & Silvestri, Vol. 2 with Wolverine (1988) #38-46 (in which Cable appears from #41-43). See Wolverine for more information. New Mutants #93-94: In Cable & The New Mutants, above. Cable is a supporting player in this crossover event; it shows his earliest interactions with the X-Men beyond the New Mutants. Ran through a Uncanny X-Men (1981) #270-272; New Mutants (1983) 95-97; X-Factor (1986) 60-62, plus a prologue (without Cable) in Uncanny X-Men (1981) #235-238. Available in oversize hardcover. Cable appears significantly in this X-Tinction Agenda epilogue issue, butting heads with the assembled classic X-Men for the first time. This 2014 mini-series is very carefully situated to work just prior to Deadpool’s first appearance in New Mutants #98, as it’s with a New Mutants teams with Rahne or Feral. Collects early Liefeld-illustrated Cable appearances in New Mutants #98-100, X-Force #1-4, and Spider-Man #16 (a crossover to X-Force #4). Note that #98 is Deadpool’s debut! See X-Force for other options, including X-Force Omnibus, Vol. 1. This is a 1991 annuals crossover between New Mutants (1983) Annual 7, New Warriors Annual 1, Uncanny X-Men (1963) Annual 15, and X-Factor (1986) Annual 6. Cable does not appear in the New Warriors annual. Also in New Warriors Omnibus, Vol. 1 and X-Force Omnibus, Vol. 1. This Wolverine, Jubilee, and Cable retroactive team-up seems to be set prior to Cable’s canonical appearance in Wolverine’s 1998 series. The collection includes #19-25. Collects Wolverine (1988) #38-46 and Wolverine: Rahne of Terra OGN (in which Cable also appears).See Wolverine for more information. X-Force (1991) #1-4, Spider-Man (1990) #16 & X-Force (1991) #4: Also in A Force to be Reckoned With (above). See X-Force for other options, including X-Force Omnibus, Vol. 1. Collects #5-15 and elements of Annual #1. See X-Force for other options, including X-Force Omnibus, Vol. 1. X-Force (1991) #6-10, Annual 1 (3rd story), & 11-15: Also in X-Force: Under the Gun. See X-Force for other options, including X-Force Omnibus, Vol. 1. The present day elements of this story fit here. This collection collects Cable’s first appearance in New Mutants #87, Cable: Blood and Metal #1-2, and Cable #1-4. Also collected in X-Force Omnibus, Vol. 1. Cable enters the fray in X-Men Vol. 2 (1991) #14 and appears throughout this series. Available in oversized hardcover. Begins in May 1993, concurrent to Uncanny X-Men #300, X-Men #19, and X-Force #22. Fabian Nicieza scripted for almost two years before ceding scripting duties to Jeph Loeb, who stuck around through issue #39. 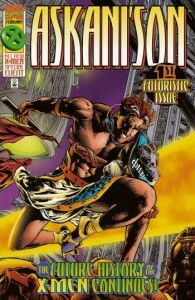 Afterwards the title bounced around to multiple creative teams before settling with writer Joe Casey for a lengthy run. See X-Force for collections of Cable’s various X-Force appearances listed throughout. 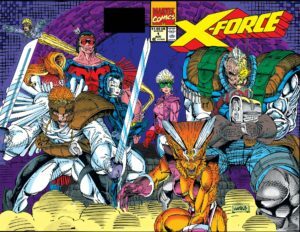 Collects X-Force (1991) #32-43 & Annual 3; Cable (1993) #9-20; New Warriors (1990) #45-46; and Phalanx Covenant crossover issues X-Factor (1986) #106; Excalibur (1988) #82; and Wolverine (1988) #85. Also collects Wolverine #85 as part of the Phalanx Covenant crossover. The “Generation Next” crossover that launched Generation X; collects X-Factor #106, X-Force #38, Excalibur #82, Uncanny X-Men #316-317, X-Men #36-37, Wolverine #85, Cable #16, & Generation X #1. A paperback with incredibly low reproduction quality on newsprint paper. 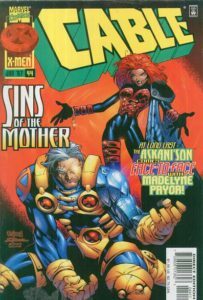 Collects the issues leading up to the classic Age of Apocalypse crossover, including X-Factor #108-109, Uncanny X-Men #319-321, X-Men#38-41, Cable #20 and X-Men Age of Apocalypse Ashcan Edition. Collects all but two issues of the original Age of Apocalypse Saga! Contains Uncanny X-Men #320-321, X-Men (1991) #40-41, Cable (1993) #20, and all of the original Age of Apocaylpse issues except for X-Men Chronicles #1-2. #32-36: See Marvel Universe Events: Onslaught. You can either buy these issues in a single Onslaught Omnibus, or spread across a series of Onslaught Epic Collections. Note that #34 continues to directly to the Hulk #444 guest appearance below. #32-39 & X-Force/Cable Annual ’96: Cable & X-Force: Onslaught! After #42: Captain America Vol. 2 (1996) #6 (may not be a canonical appearance, since Captain America was in the Heroes Reborn universe at the time). Collects Generation X #26-31, Cable #45-47, X-Men #65-70, X-Force #67-70, Uncanny X-Men #346, Wolverine #115-118, and X-Man #30. A prior X-Men: Zero Tolerance TPB (ISBN 078510738X) in the old “Marvel’s Finest” trade dress collected only #27 from GenX, and omitted X-Force #70 and the UXM issue. Cable/Machine Man Annual 1998 & Machine Man/Bastion Annual 1998: In Hellfire Hunt, above. An epilogue of sorts to Zero Tolerance. Also collects X-Men #46-47, a crossover from Cable #63. A panel from #60 is used as a flashback in Vengeance (2011) #4. Though this doesn’t include a Cable issue, it collects his next four appearances after #72 and sets up his participation in the next volume. Collects Uncanny X-Men #372-375, X-Men #92-95, Astonishing X-Men #1-3, and X-Men 1999 Yearbook. Collects X-51 #8, Uncanny X-Men #378 and Annual 1999, Cable #77, Wolverine #148, X-Men Unlimited #26, X-Men #98, and X-Men: The Search for Cyclops #1-4. Cable appears in Search for Cyclops, but it falls almost a year later in continuity – see below. Collects Uncanny X-Men #379-380, Cable #78, X-Force #101, Wolverine #149, and X-Men #99. 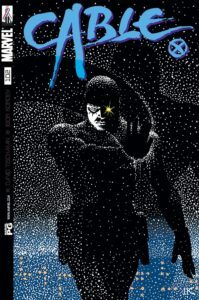 #79 marked the start of the Revolution storyline that rebooted the arcs of all X-Books, coincident with X-Men Vol. 2 #100. After #86: Cable begins the Dream’s End crossover in Uncanny X-Men #388. Collects the crossover of Uncanny X-Men #388-390, Cable #87, Bishop #16 and X-Men #108-110, in which Cable acts as Senator Kelly’s bodyguard. 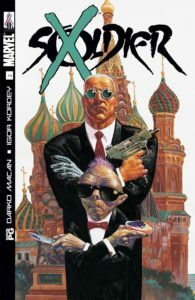 For the final 10 issues of its run, writer David Tischman and polarizing artist Igor Kordey shifted the focus of the series to a guerrilla-warfare, anti-terrorist plotline. After #100: Domino Vol. 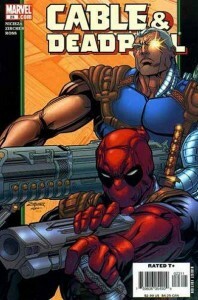 2 (2003) #2, Deadpool Vol. 3 (1997) #61 (need to check this; based on the timeline it could actually be Domino Vol. 1). Both Deadpool (Agent X) & Cable (Soldier X) were relaunched to fall more in line (and letter X) with the main New X-Men series. Collects limited series #1-6. #1 occurs between C&D #12-13, and the rest of the series occurs during #15 (in which Cable does not appear). After #35 (and its subsequent guest appearances), Cable joins Rogue’s X-Men team in X-Men, Vol. 2 (1991) #190 and appears through #200 and does not return to his own title until #40-42, after which he does not appear again (though he is implied in #50). 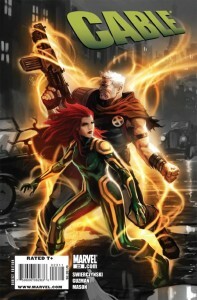 Cable does not appear in X-Factor (2006) #23, despite it being listed in some reading guides. Issues #43-44 also collected in Wolverine vs Deadpool with several other fights between the two characters. Cable does not appear in #188-189. Available in oversize hardcover. Begins May 2008, on the heels of the Messiah Complex crossover and concurrent with the launch of X-Force (Vol. 3) and the newly rechristened X-Men Legacy #208, as well as Uncanny X-Men #496. In the Marvel Universe, it begins a month prior to Secret Invasion. The entire run of Cable deals with his ushering his young charge, Hope, through her life (and the timestream) leading up the 2010 X-Men event Second Coming. The run bears a significant sci-fi, dystopian vibe, as Cable can only travel forward in time. Much of the 25-issue run bears stunning covers that merge comics bombast with photo-realistic details – with some interior art to match! Cable appears throughout this event as an important player. Available in oversize hardcover. Though released later, this acts as a sort of epilogue to Cable & Deadpool and shows some behind-the-scenes moments from Messiah Complex. There are flashbacks to this period in the Messiah War one-shot, below. Also collects King-Sized Cable, which is at the beginning of this run (it follows #5 directly). Also available in hardcover. After Cable #12: X-Men: Second Coming (2010) #2 (flashback), Psylocke (2010) #1 (2nd story), Dark X-Men (2010) #1 (2nd story), X-Men: Legacy (2008) #230 (2nd story) X-Force (2008) #22 (2nd story) – all later collected as X-Men: Hope (2010) #1. Also collects X-Men: Hope. Also available in hardcover. Cable plays a very significant role in this massive story. Collects Second Coming: Prepare, Second Coming #1-2, Uncanny X-Men #523-525; New Mutants #12-14, X-Men Legacy #235-237, X-Force #26-28. Also available in hardcover. You may also wish to purchase X-Men: Second Coming Revelations in hardcover or paperback, which contains companion stories to Second Coming – though, Cable does not appear. Cable is missing after Second Coming. In this period: A single panel flashback in X-Men: Prelude To Schism (2011) #1 is likely to Messiah Complex; a cameo image in Avengers (2010) #2 is from an unspecified point in time. A future Cable that appears in Uncanny X-Force (2010) #28-29 is likely made impossible due to the actions in that story. Cable returns … to fight the Avengers? It’s a four-issue knock down, drag out bash with some major consequences for Cable and the Marvel Universe as a whole. However, it’s not really required reading to understand Avengers Vs. X-Men. 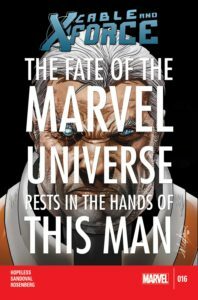 Collected in oversized hardcover and paperback, this series comes after Schism and acts as a lead-up to Avengers vs. X-Men. 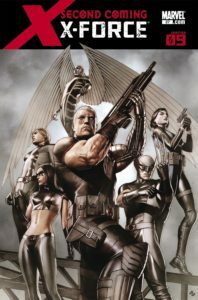 A relaunched X-Force are lead by Cable as they commit crimes to try to avoid a future apocalypse. Written by Dennis Hopeless with regular art from Salvador Larroca, and starring Cable, Domino, Colossus, Forge, Dr. Nemesis, and Boomer. This title is surprisingly effective in maintaining the classic X-Force vibe of humor merged with wanton violence. Also includes a crossover between Cable and X-Force #18-19 & to Uncanny X-Force #16-17. A new X-Force title penned by Si Spurrier merges some of the casts of the two prior X-Force books, starring Cable, Psylocke, Fantomex, and a back-from-obscurity Marrow! Cable is the lead of this team and star of the title. See X-Force. It’s unclear to me if this occurs just prior to Secret Wars or just after; Deadpool is still working with Agent Preston at SHIELD. Check Amazon for Marvel’s newest Cable titles.